The Cuban government will not recognize any authority in Paraguay if it does not stem from the legitimate suffrage and the exercise of sovereignty by the Paraguayan people, reads a note issued by the Cuban Foreign Ministry condemning the recent coup that ousted President Fernando Lugo. The Cuban government strongly condemns the parliamentary coup perpetrated against constitutional President Fernando Lugo and the people of Paraguay, reads a note. Actions like this one aim at thwarting progressive changes and genuine Latin American and Caribbean integration in “Our Americas,” reads the note. The coup in Paraguay adds to a long list of attempts against the self-determination of Latin American nations, which have always been perpetrated by the oligarchy, and with the responsibility, complicity or tolerance of the US administration, says the Foreign Ministry. In the note, Cuba denounces that after decades of bloody military dictatorships, which murdered hundreds of thousands of people and imposed state terrorism and torture with full impunity, the violent and anti-democratic strategy has been retaken, first with a military coup and an oil strike against Venezuela’s Bolivarian Revolution; a destabilizing and separatist attempt against Bolivia; a military coup against progressive forces in Honduras, and later a coup attempt against the Revolution in Ecuador. The note adds that the Cuban government will maintain its medical cooperation, which is strictly humanitarian, at the service of the Paraguayan population. Therefore, the “Maria Auxiliadora” Ophthalmological Center, which has helped some 18 000 Paraguayans recover their sight, will continue to operate as long as necessary, concludes the note signed by the Cuban Ministry of Foreign Relations. Approaching 100 delegates attended a Havana Club Rum Reception at Unite Policy Conference yesterday to show solidarity with the Cuban people, oppose the illegal U.S. blockade of the island and welcome the wives of the Miami Five. Newly elected Cuba Solidarity Campaign Chair and current Unite Assistant General Secretary Diana Holland condemned the ongoing blockade which forbids US-owned and part-owned companies from trading with Cuba. Diana reflected on the extraterritorial nature of the blockade which penalises foreign companies that do trade or process finance from Cuba and re-emphasised Unite’s commitment to campaign against this economic injustice. “The blockade is still very much alive and kicking,” declared Diana. “Only last month the ING bank was fined millions of dollars for processing Cuban financial transactions because the US farcically keeps Cuba on its list of state sponsors of terrorism”. The economic blockade is just one facet of a dirty war against Cuba. “For over 50 years, Cuba has been subjected to continuous terrorist attacks organised, sponsored or tolerated by the US government and its agencies,” said Diana. This has included a range of chemical and biological attacks and the bombings to airliners and hotels. To defend itself against terrorist attacks, Cuba sent five agents to infiltrate Miami-based terrorist organisations. 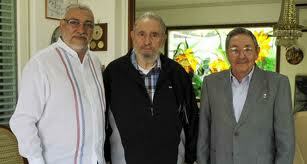 After the FBI asked for Cuba’s help to deal with the terrorists, it used the evidence to arrest the Five. Despite condemnation by the UN and Amnesty International, the Miami Five remain unjustly imprisoned in America and their families are denied regular visitation rights. For the first time, Unite welcomed all four wives of the Miami Five to conference. Elizabeth Palmiero – wife of Ramón Labañino– spoke on behalf of the wives and thanked Unite for their continuing support. “The only thing our husbands are guilty of is protecting the Cuban people against terrorist attacks,” declared Elizabeth. “The case is political and there is no other way to resolve the injustice than building the pressure of international public opinion against the policies of the U.S. government”. Elizabeth called on President Obama to intervene personally. “For the American authorities, it is not enough to keep our husbands in prison,” she said. “But they must use us – by denying us visitation rights – to further attack our husbands”. “We have suffered but we know that tears won’t bring freedom to the Miami Five, so we must continue to fight”. Diana concluded by reasserting Unite’s support of the Miami Five and their families and called on all Unite branches to affiliate to the Cuba Solidarity Campaign. Central America has long been a popular base for political, military and humanitarian operations targeting Cuba. With that in mind, I was intrigued to see that USAID in 2009 awarded more than $1.5 million to the Instituto Interamericano de Derechos Humanos in Costa Rica. The initial award, dated April 17, 2009, clearly shows Cuba as the "principal place of performance." 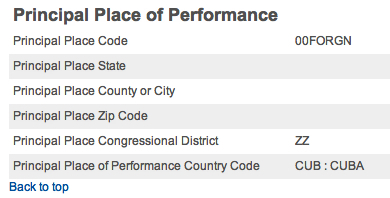 In federal government lingo, that's the place where a job or contract is carried out. But I only saw the Cuba reference once in the five listings related to the contract on the government website, USASpending.gov. Cuba was the target country for only the initial contract, worth $400,000. Cuba is the main target of the $1.5 million contract, but USAID and the contractor have neglected to cite the place of performance, intentionally or not. Cuba was the principal place of performance initially, but that changed. Work is done in both countries and USAID doesn't care how it's listed. The Cuba listing was a mistake. Greater clarity would increase the transparency of USAID programs in the Americas, and it would lessen suspicions that the agency may be doing semi-clandestine work in Cuba. USASpending.gov records don't give details of the contract. The work is described as "development assistance." The IIDH is listed as a USAID partner that is taking part in a program to build "more inclusive and equitable democracies in the Americas." 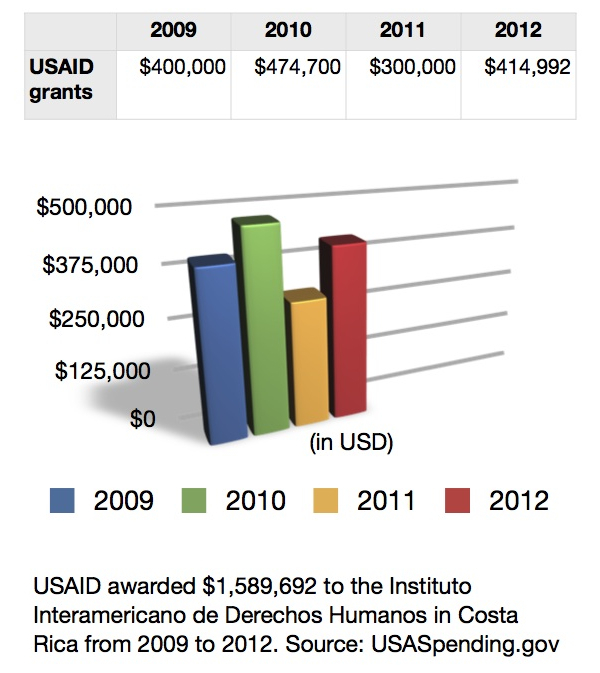 The group's contract with USAID ends on Aug. 31, 2012, USASpending records show.